I received an email today from Doug Madory of Renesys, a company that monitors the dynamic state of the global Internet. 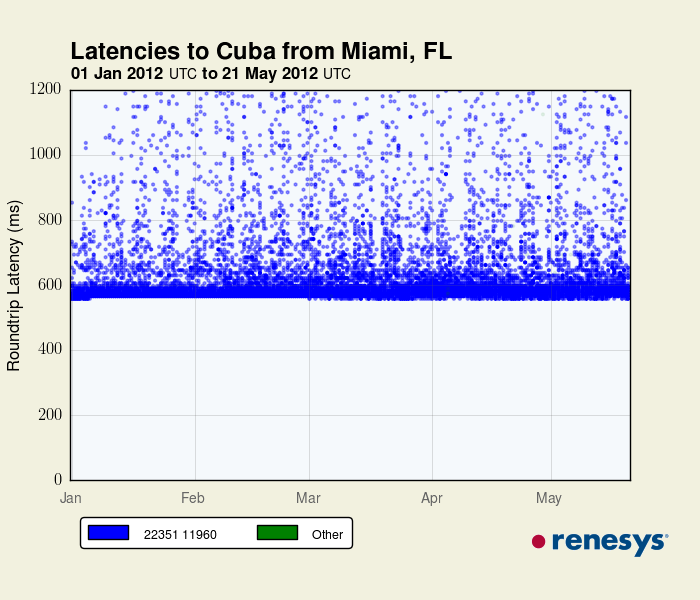 The numbers in the figure legends indicate the connecting autonomous networks -- CubaData (11960) is the state telecom of Cuba, and they have three satellite providers Tata (6453), Intelsat (22351) and NewCom (32034). 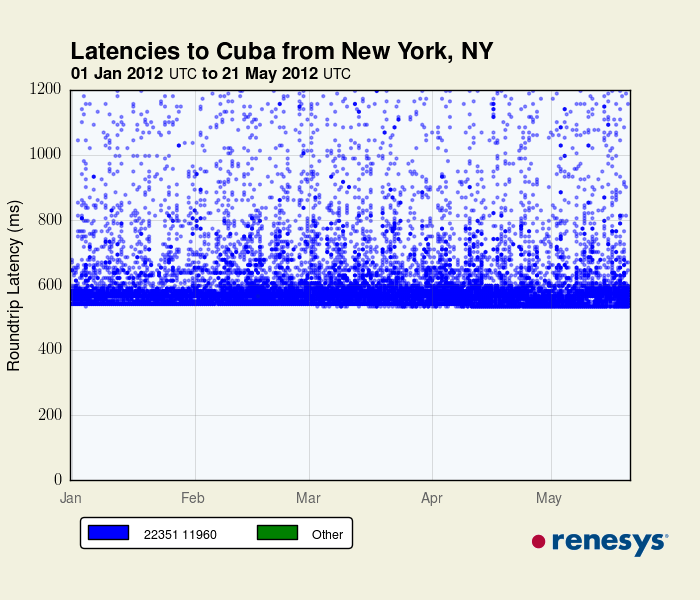 Renesys is "The Internet Intelligence Authority" -- they constantly monitor the state of the global Internet. You may have seen their reports of network outages when nations went off line during the Arab Spring, for example, this Syrian episode. You can get a sense of what they do by following their blog and Internet events bulletin. It seems a government official from Venezuela said that the cable is fully functional, but it's up to the Cuban government to decide what to do with it. It looks like they are actually afraid of it as you said. Interesting, however this is not consistent with a recent statement from the venezuelan minister of science and technology, saying the cable is up and operational. Maybe it's isolated from the cuban backbone. 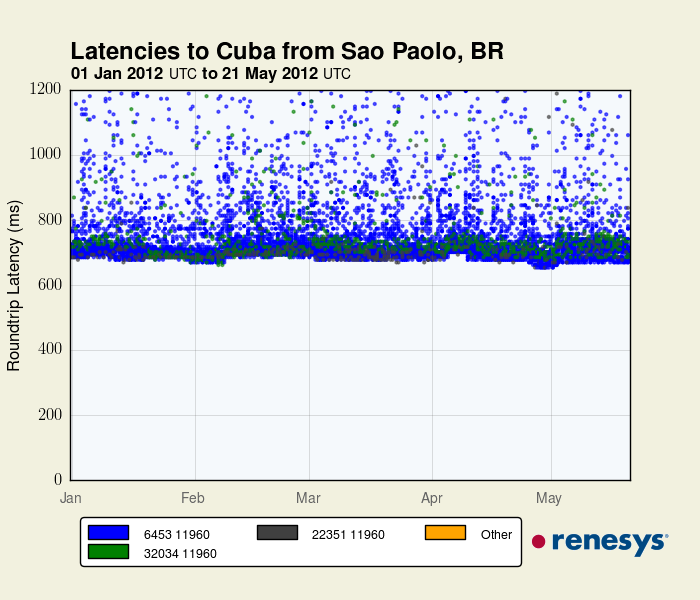 I just heard that there is connectivity between some Cuban and some Venezuelan government offices, which would not show up in the data reported here. That would not qualify as Internet connectivity. Maybe they are running tests. 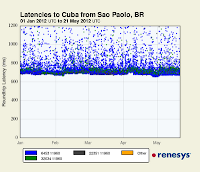 This conclusively demonstrates that the paths from the three U.S. and the Sao Paolo Internet connections that Renesys used to CubaData's Internet network route over a satellite. It says nothing as to whether the submarine cable in question exists nor whether it is operational, of course. I agree that it exists and could be operational, but a limited link is not what one would be considered Internet Access. 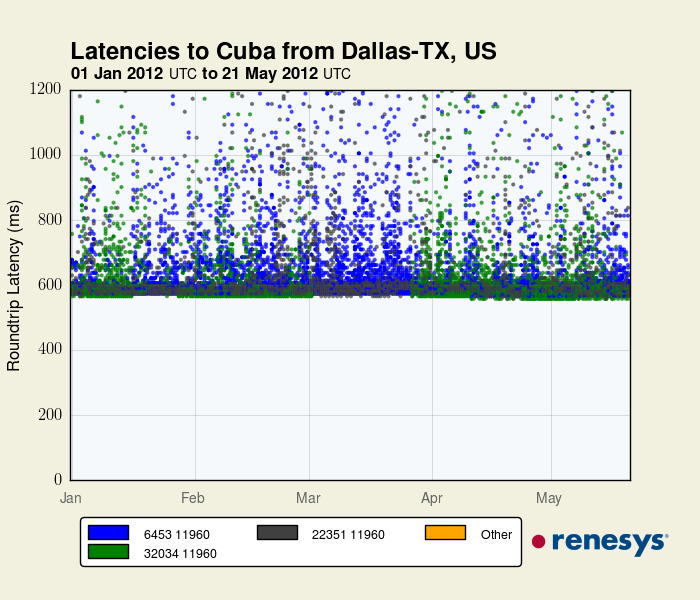 Check out the article that Muchas Gracias linked to above (http://www.diariodecuba.com/cuba/11252-venezuela-asegura-que-el-cable-de-internet-esta-absolutamente-operativo). That would be consistent with what I have heard, but not seen confirmed -- that it is being in Venezuelan government offices to access some databases stored in Cuba. If that is the case, this might be a pilot test.